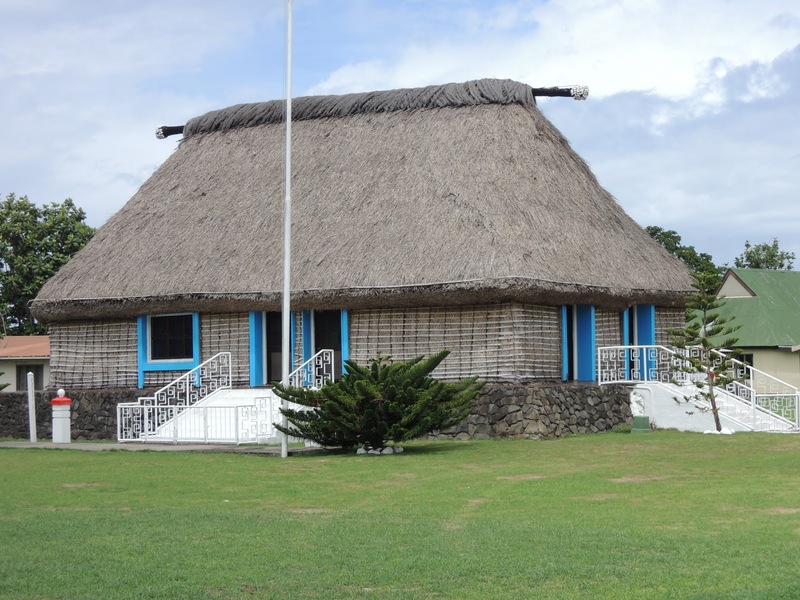 Happy New Year from Fiji! We spent the last two days taking in some sights outside the tourist area. Picture of the Fijian Chief's governing building at the "first/head village". The inlet of the "first landing" where the first Fijian people landed and colonized the islands from Africa. 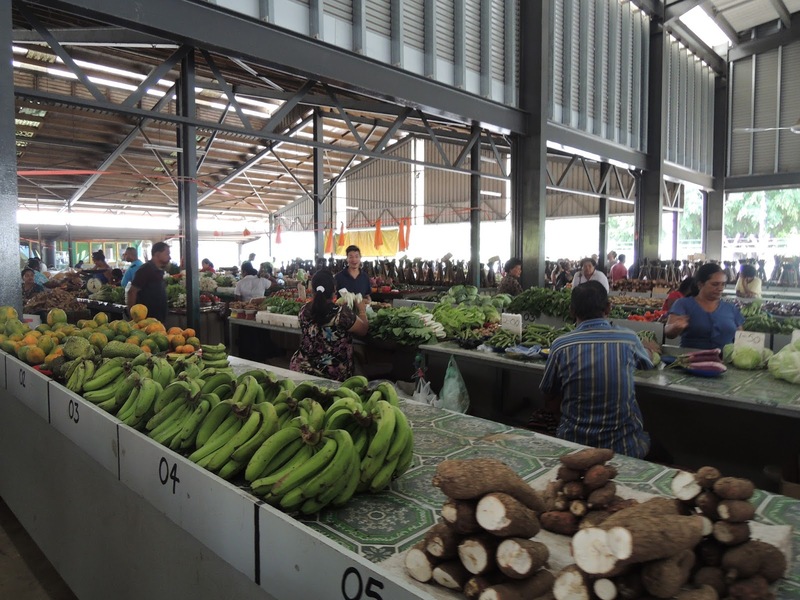 We toured a local market. Lots of tropical fruits and vegetables. They had a whole room of just Kava in various states of processing (apparently not just a popular drink in Hawaii). We had some local food. 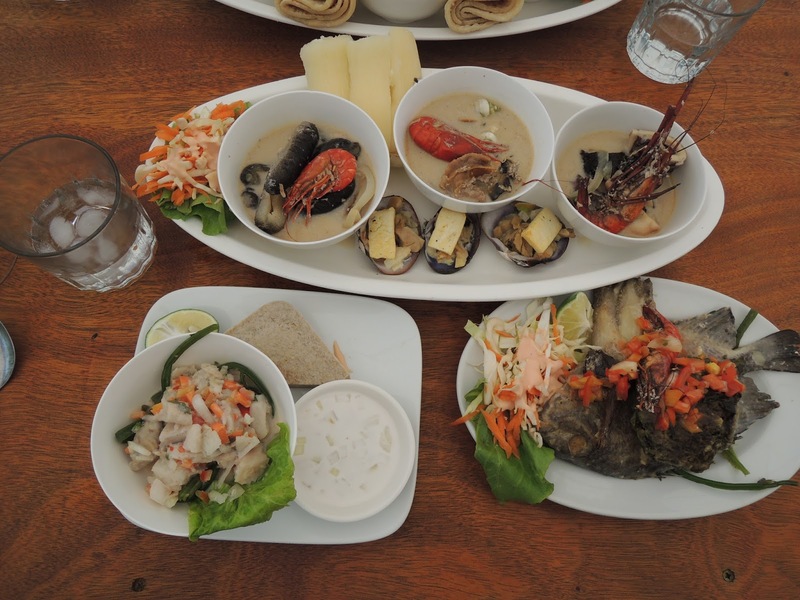 Sea Cucumber, Octopus, shrimp, mud bugs, Kokoda, clams, snails, spinach fritter, cassava and fish. Sunset as we waited for midnight (frogs everywhere). 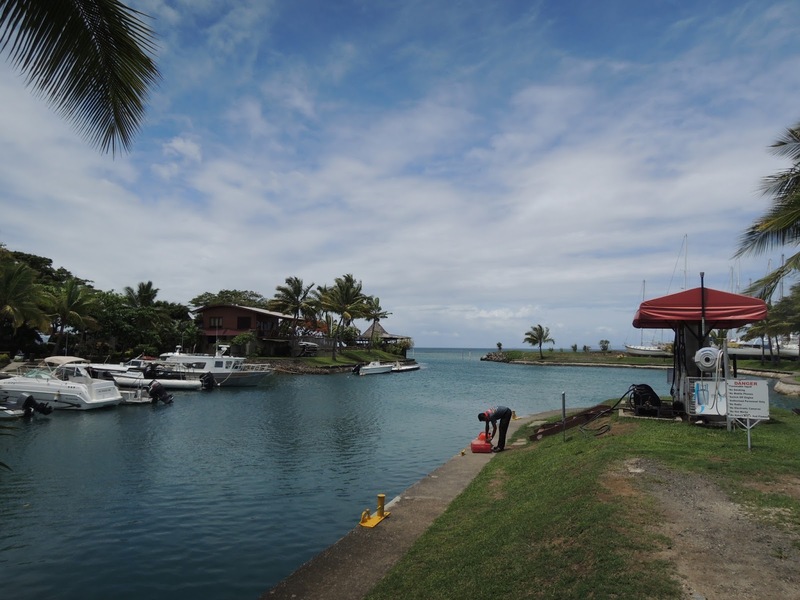 Just a few quick photos from the small island of Mana just off the coast of the main island. BBQ (more accurately grilling) culture is pretty big here in Sydney, I was talking with my coworkers about my friends back home and their awesome briskets and pulled pork in their big green eggs. Here they are more into grilling kabobs and steaks on the "barbie" it's a little more rare to hear about smoking and slow cooking. 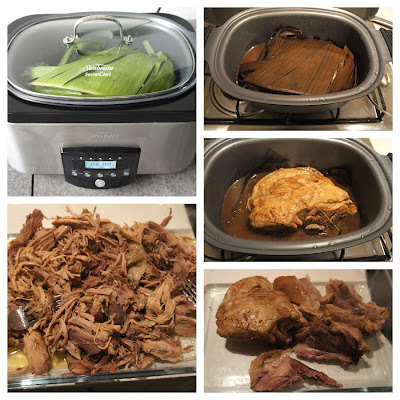 So folks seemed pretty excited when I told them I had previous made pulled pork in a slow cooker, I ended up promising to bring in a "Hawaiian" bento with my slow cooker Kalua pulled pork. 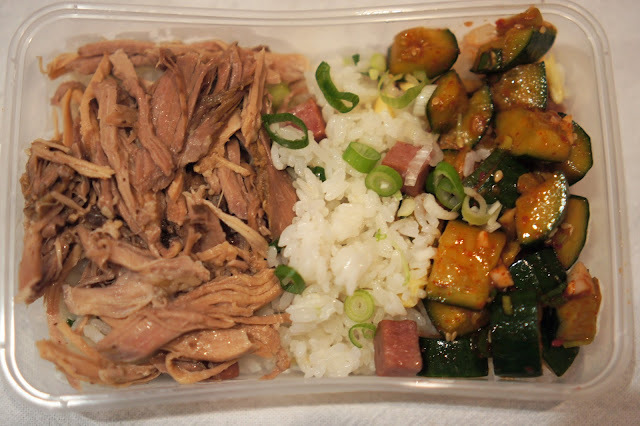 I suppose this one is not much different than my first Hawaiian bento. The box is smaller and no compartments so I've had to learn to deal with "sauceless" dish (rather my backpack learned the perils of sauces during my walk to work). One of the "cool" things here is that most everyone has standardized on "takeaway" boxes (the clear container above). They're all microwave safe and dishwasher safe, every lid fits on every box and there are two sizes that are all uniformly the same (more or less). I'm probably more excited about this than I should be but you have to take your small victories where you can. Anyway back to the box. First the Kalua pulled pork. I applied my learnings from last time, I had the butcher take the skin off. 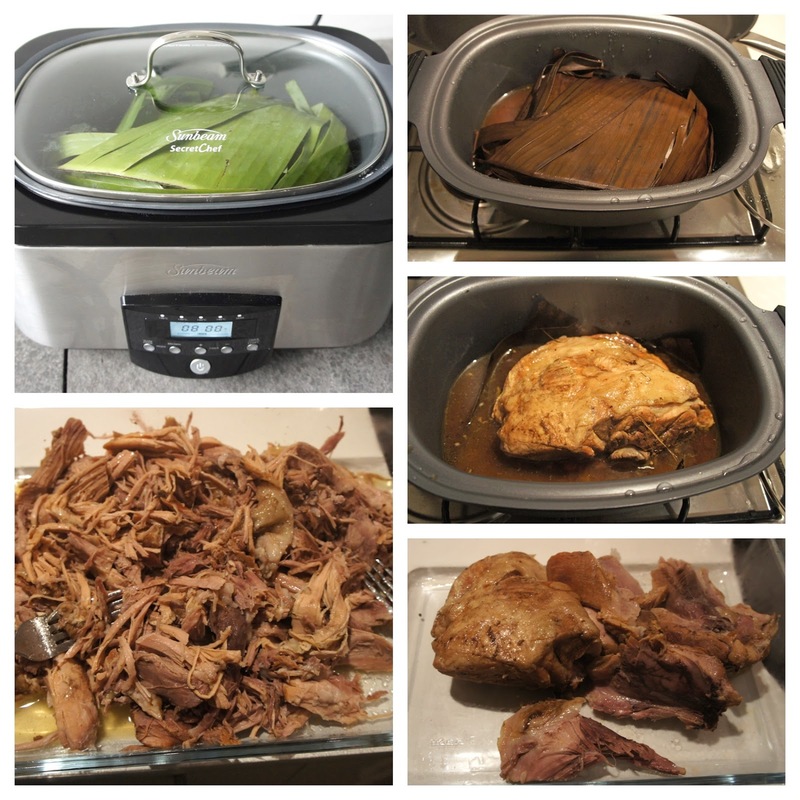 The rest was super simple, Pork shoulder, Himalayan pink sea salt, banana leaves, and 1 tbsp of liquid smoke (I used mesquite). 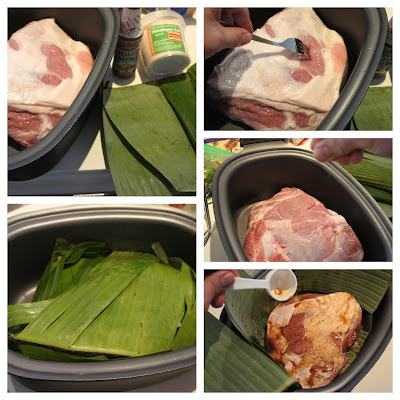 I liberally seasoned the pork, "forked" the pork, added the liquid smoke and wrapped the whole thing in a couple of banana leaves. Into the slow cooker and you're done. (yes that's it.) The cook time depends on the size of your pork generally I go for about 1.5 hours per pound of pork so this one went for about five hours.The pork came apart into a few big pieces as I tried to take it out. It's such a simple to make dish but very flavorful the banana leaves make all the difference in the world. 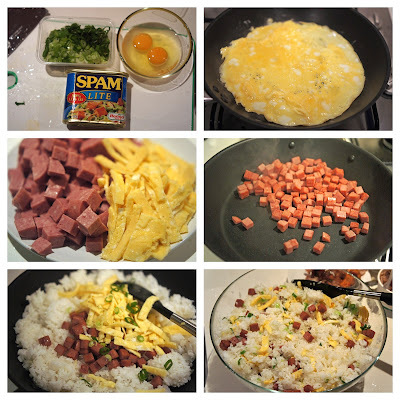 Spam Fried Rice, you can read about it in my previous post. Same as last time only this time with a few detailed pictures of making it. I opted for Spam "lite" which is still reasonably salty. The recipe is pretty simple. Beat the eggs with a touch of salt and make a omelette/egg pancake. Slice the egg into two inch by half inch strips and cube the spam. Pan fry your spam to give it a little bit of a crust, and remove it from the pan. 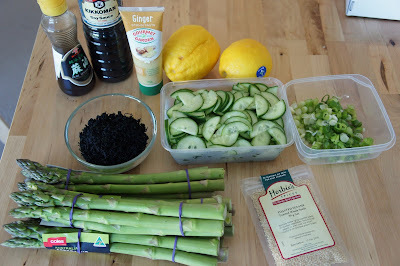 Heat some oil and add five cups of cooked white rice (use short grain you need it to stick together a little) and toss it in the pan, once the rice loosens up with the oil, add in your spam and eggs and half of your scallions. 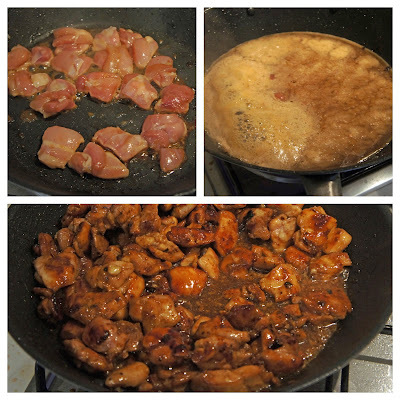 You want to get some of the onion flavor going as well as get some of the rice a little toasty to give it nice aroma. Just as your about done toss in the rest of your scallions and take it off the heat and stir and incorporate the scallions (the residual heat will gently cook the newly added scallions). 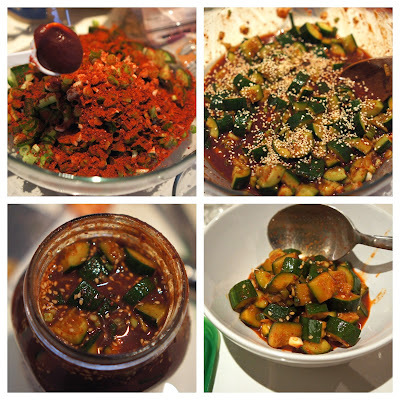 Finally the cucumber kimchi, Hawaiian food is heavily Asian influenced you can find kimchi just about everywhere. This dish is very similar to the Chinese pickle I've done before (actually I've done quite a few). This one is just a lot more spicy. Unlike regular cabbage kimchi I didn't let this one ferment over weeks. Kimichi sounds intimidating but it's really not that hard, there's just a bunch of prep work involved. 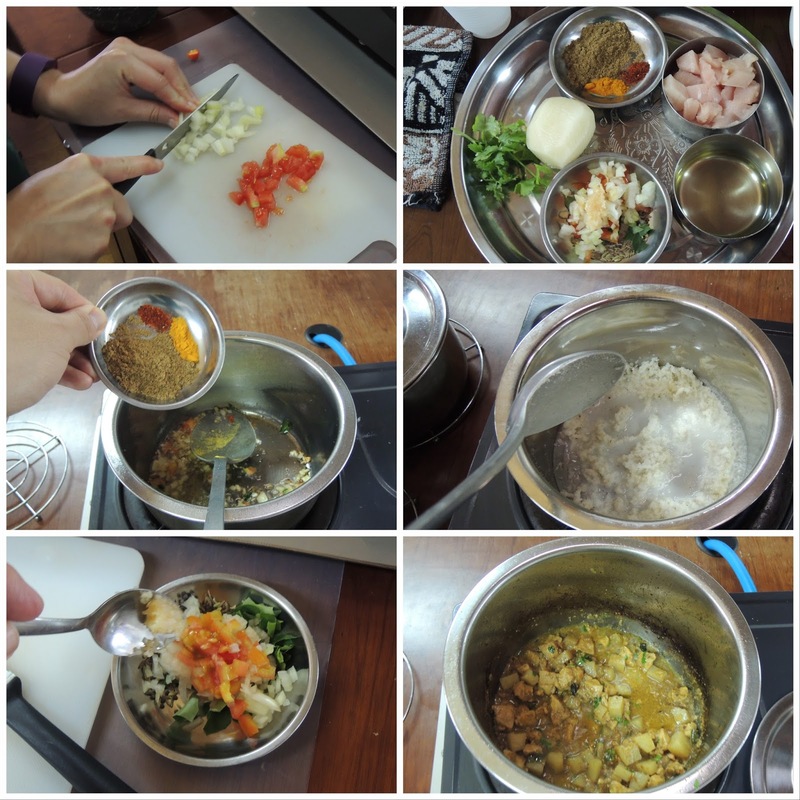 Yes the ingredients are many (see recipe below) but most of the work is in chopping up front. So you mince a bit of garlic (ok that's more of a chop than a mince) and slice some scallions. For the cucumber I like to cut them in half lengthwise and them bash them with the flat of my knife. This opens up the surface area in the flesh of the cucumber to absorb the seasoning. 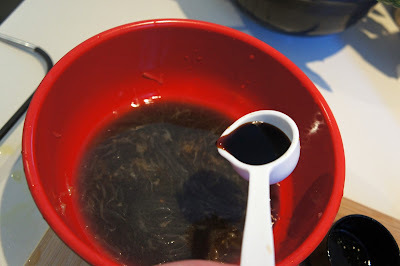 After you get all the prep done it's just a matter of mixing in chili flake, gojchujang, sugar, vinegar, soy sauce and sesame seed. Give it a good toss and I put it in a standard size Mason jar. It's relatively good to go after an hour but I held it in the jar for a week and it only got better. Be warned this stuff is pretty salty, so it goes really well with the fried rice and the pork, eating it together you don't really need to add any salt to anything. Everyone was very pleased with the bento. The extras were gobbled up pretty quickly at home. 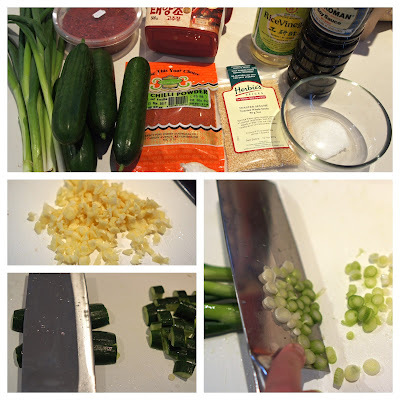 Cut cucumber lengthwise, using the side of your knife "smash" the cucumber halves until they split (so you end up with quartered lengthwise cucumber). Chop into 3/4" segments. Into a non-reactive bowl combine cucumber, garlic, scallions, chili powder, flake, gochujang, sugar, rice wine vinegar, soy sauce and sesame seeds. 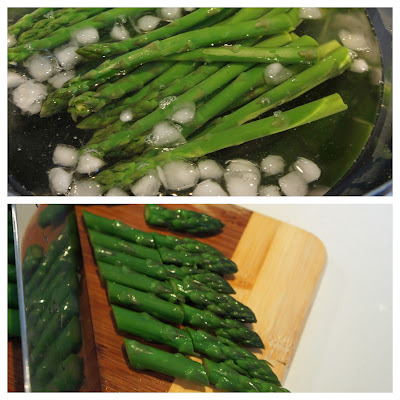 Cover and chill in the fridge for minimum of 30 mins optimally an hour before serving. 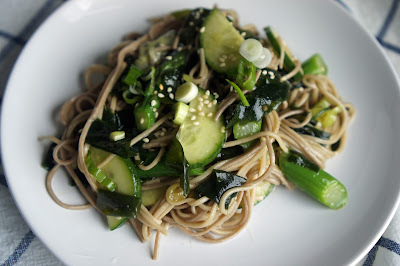 The Missus had a hankering for soba noodles so I did a little search in the backlog and found a cold soba salad that seemed pretty yummy. I paired it with a Japanese ginger chicken recipe to add a bit of protein to round out the bento. First up the ginger chicken. 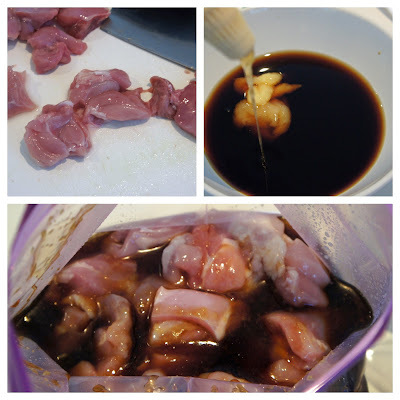 There are quite a few variations of this recipe and it's been referenced as a "comfort food" with many tales recounting mothers or grandmothers serving this dish over a bowl of rice. They're all about the same recipe wise so I picked this one that I saw featured on pbs.org. 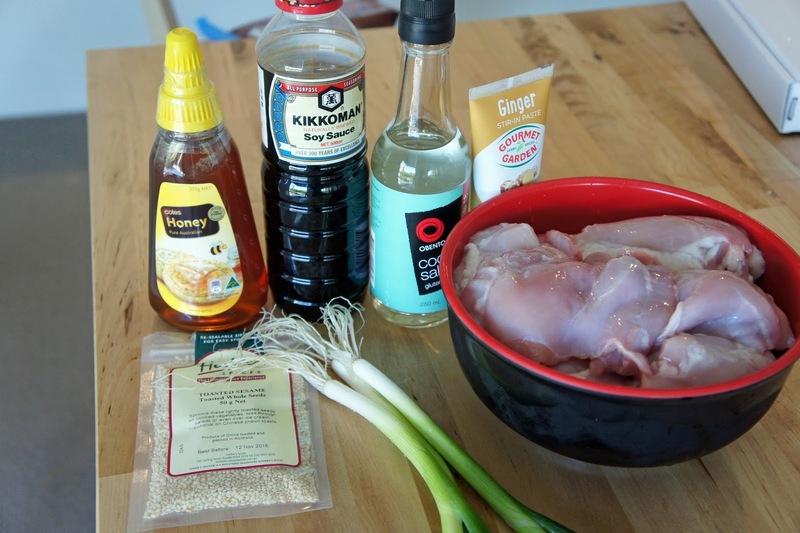 The ingredients are pretty straight forward: chicken thigh soy sauce, sake, honey, ginger, vegetable oil, chopped scallions and sesame for garnish. The marinade becomes the sauce, you cut the chicken in bite size pieces and drop it in a marinade. I let it go for a few hours as I ran some errands. Soba Salad with Seaweed, Cucumbers and Asparagus. This recipe I got from the guys at SeriousEats (I'm a a big fan of the site). The big surprise was the 1/2 ounce of wakame seaweed. 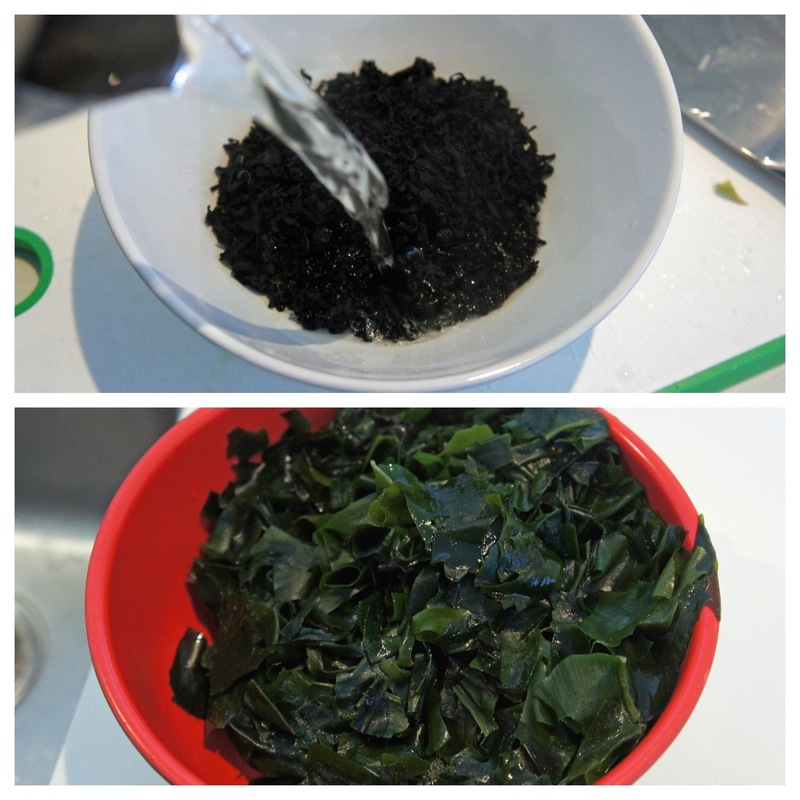 I rehydrated it in a bowlful of boiling water and it started overflowing the bowl and I had to change bowls. and then putting everything together. 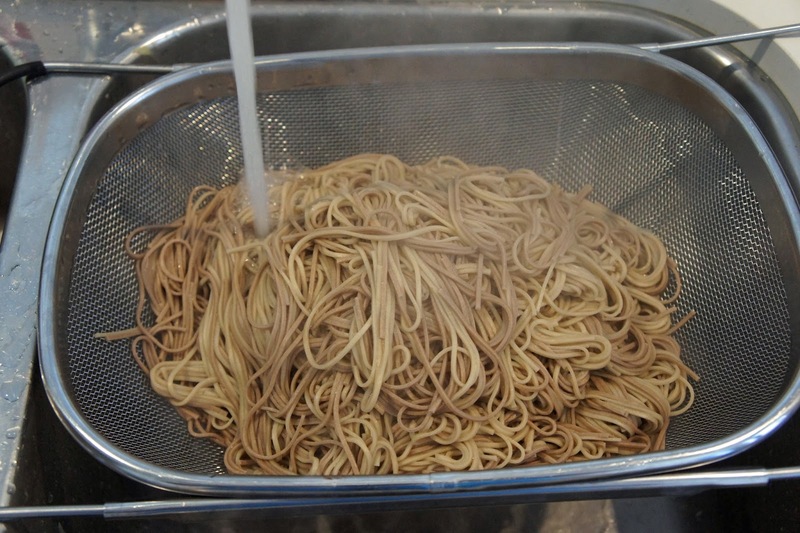 Lessons learned on the soba noodles: I tried to scale the recipe to 2x but it's way too much noodle to easily toss and incorporate the other ingredients. Also, my noodles appear to be thinner than the noodles they used (the picture they had makes it look like they used something with a lo mein noodle thickness). The weaker, thin noodles broke way too easily. I personally think a cold udon noodle would have been a good idea. 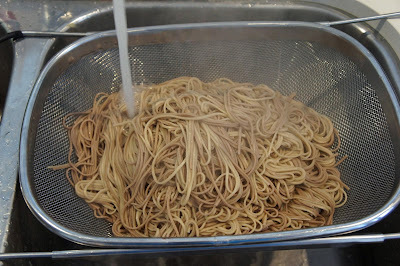 Also soba noodles don't store very well, again Udon noodles would have faired better. Still it was a very light and zesty dish. I loved the ginger chicken, It's definitely on the keeper list. I took the Missus for her birthday dinner over to Aqua Dining. It was located right off the water on the north side of the bridge next to Luna Park (literally). I was so delighted with the meal I had to share. I had their take on the Moscow mule, I didn't write down the contents but it was rum and raspberry, it was quite good. I liked the ice "flower" on top. We were presented with an amuse bouche of cured salmon with squid ink and pickled beet. Both of us chose to go with the 3 course selection. 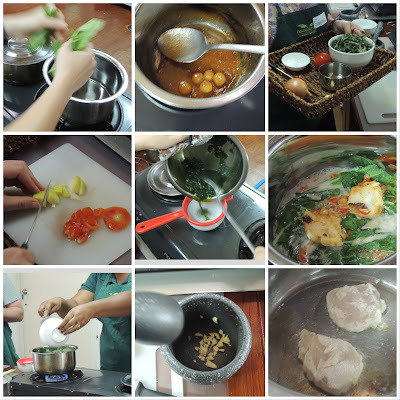 The menu was organized by course and you could choose 2,3 or 4 courses. 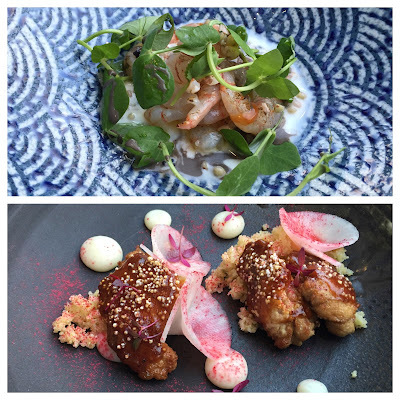 I started with the veal sweetbreads with pickled kohlrabi and puffed amaranth. 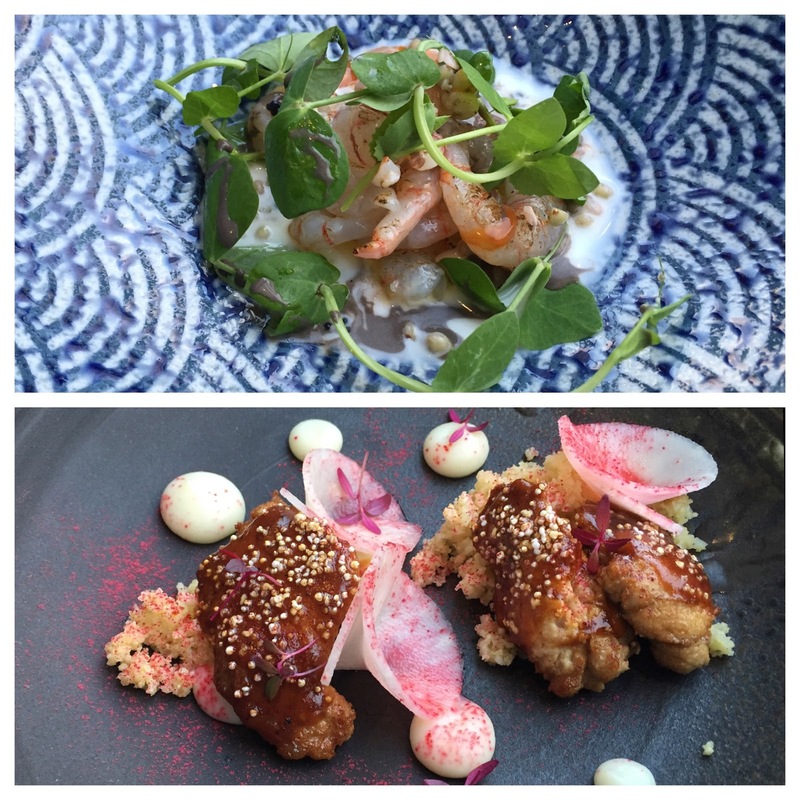 She had the scarlet prawns with buckwheat, buttermilk and black sesame. The shrimp were small but every morsel was very sweet and delicious, we're told very difficult to get and we can see why. Apparently for Christmas, prawn (shrimp) are very popular (instead of say turkey and ham). For the pasta course she went with the Maccheroncini, with 62 degree yolk, spinach and eggplant sauce. I went for the burnt semolina tagliolini with sea urchin, fennel pollen and shaved bottarga. WOW, ok when (not if) I come back I could easily order 4 courses of just this. It's got two of my favorite things in the world Uni (sea urchin) and Bottarga (an Italian version of 烏魚子) the pasta was toothy and super creamy (from the sea urchin) I didn't even mind the licorice of the fennel pollen. Don't let the plating fool you, it was a good amount of pasta. Main course: she selected the Wagyu beef with celeriac and pizzaiola sauce (a tomato based sauce with basil and oregano). Super tender and the Wagyu just melted in your mouth. I had the lamb rump with roasted baby lettuce and macadamia. I did ask about the preparation, sometimes lamb rump could be slow cooked or stewed (which i'm not partial to) but he said cooked at 60 in a water bath. This was a good temp, very flavorful and perfect tender juicy texture. We didn't go for a dessert course, I actually bought a cake back home. They have a 85 degrees bakery (it's a Taiwanese bakery) here and we love their "Taro Fantasy" cake. Taiwanese cakes tend to be a lot less sweet than their western counterparts and the cake very spongy and light in texture. Back to the restaurant. We were surprisingly full after three courses. The food was amazing and it was a great place to celebrate a birthday. It's definitely on my list of favorites of all the places we've eaten here in Sydney. If you ever make it out here check it out.